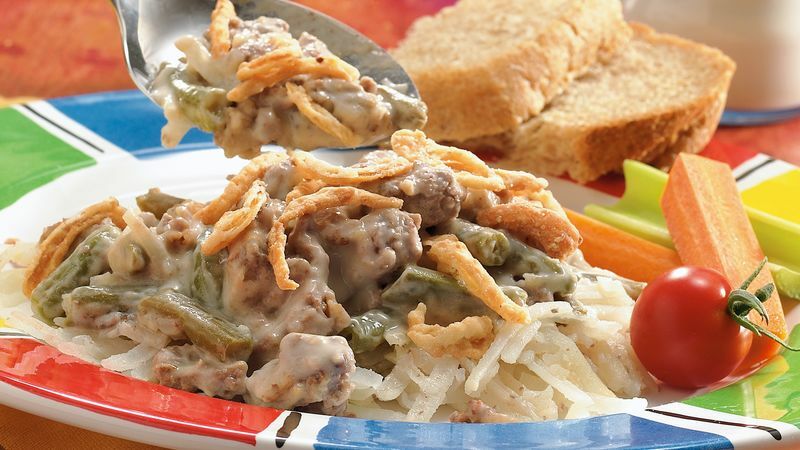 In large skillet, cook ground beef over medium heat until thoroughly cooked, stirring frequently. Drain. Add half of the onions, soup, milk and pepper; mix well. Spray 3 1/2 to 4-quart slow cooker with nonstick cooking spray. Layer potatoes and green beans in sprayed slow cooker. Top with beef mixture; spread evenly. Cover; cook on Low setting 6 to 7 hours. Top with remaining half of onions before serving. Spray the inside of the slow cooker with nonstick cooking spray before assembling recipes that tend to stick, such as this casserole. The cooker will clean up easily.